In addition to a smattering of new freckles and a CD full of samba music, Brazil also sent us home with large doses of inspiration. On Monday we celebrated El Día del Amigo (Friends' Day! how nice!) at a local Brazilian club, and on Tuesday we resumed Spanish classes with our beloved Sofía. Yesterday we went to our first Capoeira* class. Check that: It was my first Capoeira class, ever. Ken studied it for about 6 months, once upon a time. It was fun, and very hard, and today everything hurts. In my defense, let's just note that I am a 35-year-old white girl who just spent a month sitting on the beach. Eating cheese. Also yesterday, we hosted the inaugural meal of - drumroll please! - our tiny new puerta cerrada restaurant in Buenos Aires! 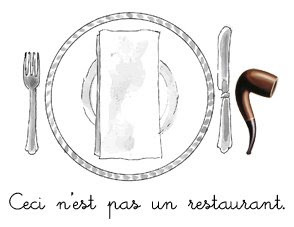 Presenting... Ceci n'est pas un restaurant. In case you're new around here, opening a puerta cerrada is one of my dreams. And thanks to our many awesome awesome friends here in Buenos Aires, it was a resounding success. All that's left is to tweak that pesky lasagna recipe before we open our closed doors next Tuesday night. Maybe we'll even have a reservation or two before then! *Capoeira is an "Afro-Brazilian art form that combines elements of martial arts, games, music, and dance." This Wikipedia page has some nifty little animations of some of the techniques that apparently even non-cartoon-people can do with their bodies. Who knew? Oh, my God, this sounds incredible. I want to fly to South America for one of these dinners! oh lady...you are just living the dream. sigh. salivating. p.s. tonight I had one of the biggest poop debacles ever. i'm just sayin...i LIVE through your post. Wow, that sounds amazing. I hope you post pics of the dinners. i would LOVE to come to one of your dinners!!! ps: In Brazil, we dont celebrate "Él Día del Amigo", but "O Dia do Amigo". We speak portuguese, not spanish. Cheers!